JINDO, SOUTH KOREA — South Korean police have formally arrested the captain and two crew members of a doomed ferry, on charges of deserting their passengers shortly after the vessel capsized Wednesday and sank. Investigators are alleging the 69-year-old captain failed to carry out his duty to protect passengers when, according to witnesses, he was one of the first to leave the sinking ship. The ferry Sewol went down off the southwestern island of Jindo with 476 people on board. Thirty-two people are confirmed dead, and 270 others - many of them high school students - remain unaccounted for as hope diminishes for finding more survivors. Divers saw three bodies through a window Saturday, but were not able to reach them. South Korea's Yonhap news agency said the captain also is suspected of instructing passengers to remain seated, even as the ferry began rolling onto its side and blocking escape routes. Earlier Friday, police said a high school vice principal who led 325 students on a four-day ferry excursion committed suicide. Police say 52-year-old Kang Min-kyu was found hanging by his belt from a tree near a building on Jindo island where survivors and relatives of the missing have been staying. A suicide note said Kang felt guilty for surviving while so many of his students remain missing. Yonhap reported that a team of 21 divers tried to enter a cabin on the submerged second deck of the five-deck ferry, where most of the passengers are believed to be trapped 35 meters below the surface. But the report said the divers - battling strong underwater currents - surfaced 14 minutes later without having gained entry. More than 500 divers are working on the rescue teams. Many of them are civilian volunteers. Experts say people theoretically could survive for up to 72 hours if there are air pockets in the submerged compartments. Authorities have not established the cause of the disaster. But some survivors report hearing a loud impact noise before the vessel rolled onto its side and began sinking. Heavy fog was reported in the area on Tuesday evening, but it is not known whether that was a contributing factor. The Yonhap report says the third officer, who was steering the vessel at the time of the disaster, is suspected of making a sharp turn while piloting the ship through a narrow route. Investigators are quoted as saying the sudden turn may have caused 180 vehicles and nearly 1,200 tons of freight to shift and disrupt the balance of the vessel before it began to list. U.S. President Barack Obama has sent his condolences to the families and says he will pay tribute to them during a visit to South Korea next week. Meanwhile, efforts to rescue some 270 people from the ferry were hampered as hopes for survivors fades. Anxiety and anger are growing among relatives of the missing, most of them high school students. Workers at Paengmok Harbor tried to console a parent of one of the missing high school children believed trapped inside the capsized ferry. Despite earlier reports of success, rescue divers failed in a third day of attempts to get to passengers inside the ship, just 20 kilometers off shore. Oxygen was pumped into the ship in hopes it would reach any survivors. Divers later tried entering a cargo hold but were not able to go further, in a struggle against wreckage, strong currents and murky water. Hundreds of volunteers and emergency workers at the harbor tried to comfort distraught relatives angry at the lack of progress and misinformation. Parents of the missing demanded a road be cleared for any who might be rescued. Authorities quickly obliged, marching in a column of police. Lee Min-seok, a rescue team captain with the Mokpo Firefighters, explained that the police presence is to keep crowds away so roads are clear enough for ambulances to pass through. Several ambulances were readied nearby with flashing lights, but the display was cold comfort. Many realize the odds of surviving this long in the waters of the sunken ship are quite low and the body count is expected to rise. Police say a high school vice principal rescued from the ferry has committed suicide. 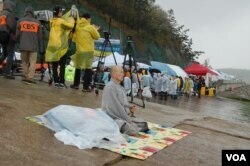 Kang Min-kyu, 52, had been the leader of a group of at least 325 students traveling on the ferry on a school trip. Police say he was found Friday hanging by his belt from a tree near a gym on the island of Jindo where survivors and relatives of those missing have been staying. He is said to have left a suicide note saying he felt guilty for being alive. Authorities have prepared cranes to try to lift the ferry, but relatives demanded they wait until there is certainty that none are alive. Government, volunteer, and donor tents and food trucks are wrapped around the harbor. Seo Joon-baek, a Salvation Army officer, says they are preparing food for about 500 people every day. They are also cooperating with other volunteers as well. It is still not certain what caused the 6,300-ton ferry on Wednesday to sink. Authorities are looking at the possibility the ship hit something in the water, or a sudden change in course caused a dramatic shift in cargo balance. The ship captain is also being investigated. Korean authorities said he had put another crew member at the wheel during the disaster, and reports said the captain was among the first to abandon ship. According to surviving passengers, the crew instructed them to stay put and it was at least half an hour into the disaster before they were told to escape. VOA Seoul Bureau Producer Youmi Kim contributed to this report.